The Bulls lost 88-77 against the Trail Blazers and will now play in the tournament loser’s bracket at 7:30 p.m. (Central) Friday against the 76ers. The Bulls Wednesday lost top rookie Lauri Markkanen, who because of a minor toe problem for precautionary reasons sat out the Bulls’ 88-77 loss to the Portland Trail Blazers. That made for three Bulls starters from the opening Summer League game lost. 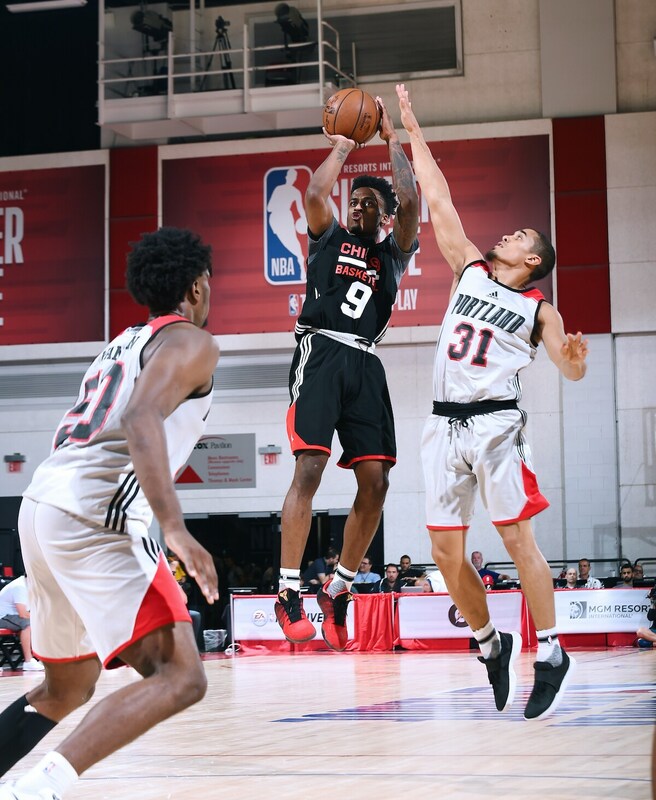 But it may not be all bad because of what the Bulls may have found, an athletic scoring guard who looks like instant offense off the bench in Antonio Blakeney. Blakeney Wednesday had 27 points and 11 rebounds, making 11 of 17 free throws with his slashing, high jumping style. That followed Blakeney’s 23 points and eight rebounds in Tuesday’s lone Bulls win. Despite improving play from Markkanen, Blakeney has stood out among his Bulls teammates with his easy scoring ability and elite athleticism. The Bulls, 1-3, now play in the tournament loser’s bracket 7:30 p.m. (Central) Friday against the Philadelphia 76ers. The Bulls last year won the Summer League tournament. The Bulls also got 14 points off the bench from shooter Brady Heslip with four of eight threes and 13 points, seven rebounds and four assists from Denzel Valentine. Ryan Arcidiacono started at point guard as he and Valentine did most of the ball handling and playmaking. The Bulls led early, 19-12 after one and 41-35 at halftime. It was tied at 61 going into the fourth quarter and then Portland pulled away. While Blakeney left you unable to pull away from the game too quickly. "I feel I’m an athletic player who can show things on both ends of the floor and rebound. The Bulls, I love the coaching staff, feel they are players’ coaches, getting on me to get better. They stay on you to try to get you better. It’s a young team and with a guy like D-Wade there it’s someone I can learn from." “I’m with the Bulls, so I’m a Bull right now and that’s what I’m focused on,” Blakeney said. That’s just for Summer League, though Blakeney said he appreciated the Bulls giving him this opportunity. Blakeney could be invited to training camp, though his play likely has opened some eyes about the undrafted player from LSU. One possibility this year for developmental players is the new so called two-way contract in which a player can shuttle between the G-league and the NBA and when in the NBA be paid an NBA salary. Blakeney projects as a shooting guard, but was overlooked in the 2017 draft because of the biases that tend to label players like Wesley Matthews, Isaiah Thomas and Draymond Green the sort of “tweeners” who slip low in the draft or out. Blakeney is considered a bit short by current NBA standards for shooting guard at just below 6-4. He’s about 195 pounds. He doesn’t handle the ball particularly well or pass frequently, especially when he drives. But, oh can he score, and it’s sometimes forgotten what a good thing that can be in a basketball game. Blakeney seems like one of those players like Lou Williams, who slipped to 45th in the draft because, well, he was a little small for shooting guard, didn’t pass and handle the ball well enough for point guard. So where could he play? Who could he guard? And then became good enough to win Sixth Man of the Year and become one of the elite and most valuable reserves scorers in the NBA. Players like Sedale Threatt, Flynn Robinson and Fred Carter come to mind, guys who were too small, or too light or too limited. But then found a way to get the ball in the basket. This Bulls team looks like it will need another someone--or two--like that. Blakeney showed that again Wednesday. He routinely beat defenders off the dribble-yes, Summer League—and was two of four on threes. He’s quietly been easily the Bulls best three-point shooter, making nine of 14 in the four games. The Bulls averaged 15 free throws per game the first three games; Blakeney had 17 on his own in Game 4. His defense is scattered, though not helped by playing for a generational underachieving LSU program in which he played with Ben Simmons in 2015-16. It might have been the NCAA’s worst defensive team. He seems willing to learn. He is active on offense off the ball as well. He ran the baseline Wednesday for back door cuts and scored and showed an ability to finish. His driving baseline dunk in Game 2 was probably the Bulls most spectacular play of the tournament and he drew a pair of free throws early against the Trailblazers trying to dunk on the run taking off from near the free throw line. Though thin, he was able to finish and score with contact for three-point plays. He’s an excellent defensive rebounder with his leaping ability, though often because he plays too far off his man. He had a curious habit in these games of calling for a screen and then not using it and going the other way. But he was so quick he repeatedly beat the defense. Though he did have some trouble with the ball when trapped and once he was driving, no one else was getting the ball. But that sort of game has served a lot of players well. Blakeney’s story is not unusual, a bigtime prep prospect who was one of the stars of the 2015 McDonald’s game in Chicago with Simmons, a high school buddy who recruited Blakeney to LSU. Blakeney was one of the top guard prospects in the country, averaging almost 30 a game in high school. He supported Simmons on a lost, non NCAA team in 2016 and then was the leading scorer on a worse team last season as the coach was fired. Blakeney, 20, declared for the 2017 draft, but with his apparent lack of a sure NBA position and the mess in college, his name wasn’t called. He wasn’t detoured or discouraged. 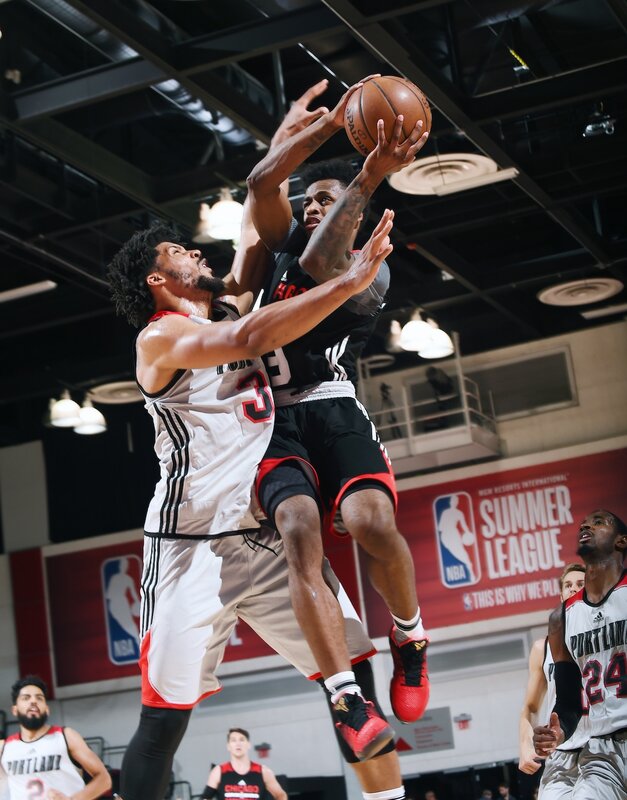 “I was an undrafted player, so me and my agent looked at the options I had for the Summer League and we thought the Bulls were the best option for me,” Blakeney said. “I had a great (pre) draft workout with the Bulls and they told me they had some interest. So this was a chance to come in and give another impression to them, to work and learn from it. "They felt I was a good story, but there are things I needed to work on, like defense. They were honest with me. The coaches are on me here in camp to get better and I like that. I want to get better, work on my weaknesses. So it’s a good thing." Blakeney looked like just another one of those Summer League tackling dummies to start, playing 13 minutes in Game 1. But he made two of three on three pointers and had a plus-13 in the plus/minus in a game the Bulls lost by 16. Summer League coach Randy Brown moved his minutes up to 23 off the bench in the Game 2 embarrassment when Markkanen and Valentine missed all 18 of their threes. Blakeney was one of two on threes and had 11 points in a game the Bulls scored 55. His minus-5 in a game the Bulls lost by 20 was team second best. The Bulls were doing better the more he was on the floor. With Kris Dunn and Cameron Payne leaving for family reasons, Blakeney Tuesday moved into the starting lineup. The last two games, he has been one of the most productive players in the Las Vegas league, averaging 25 points and 9.5 rebounds with an average of 10 free throw attempts per game. “I can bring scoring,” Blakeney notes. “People know I can score. I think what people are going to sleep on is once I learn the defensive concepts and with my athleticism, I feel I can be a two-way player and get things done on both ends of the floor. Offensively, I feel I can score at all three levels: I can get to the rim, get to the mid range and shoot the three. As a young player, I know I have to get stronger, get my ball handling tighter, work on my defense.